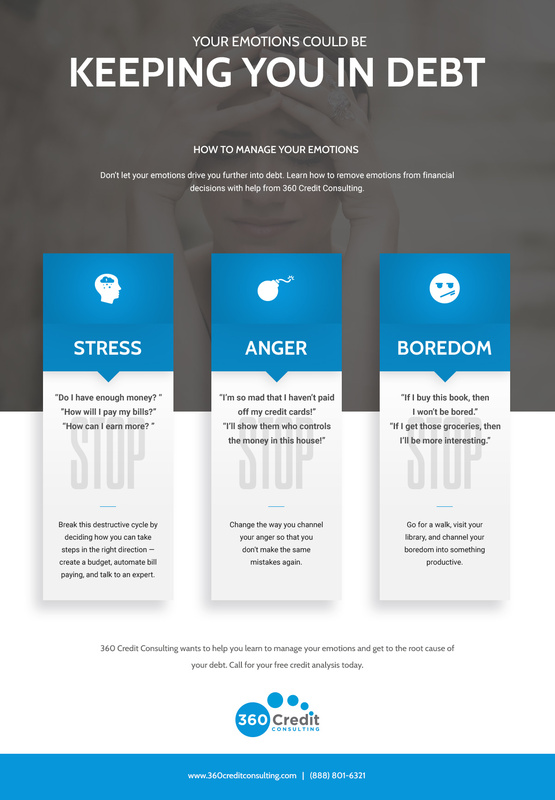 When it comes to your finances and how well or poorly you manage them, you might be surprised to learn that your emotions play a very big role. In fact, financial institutions spend a lot of money trying to capitalize on this precise fact. 360 Credit Consulting in Austin understands just how challenging it can be to manage your money and your emotions, which is why we offer debt counseling options for your convenience. Research has been done to determine the primary emotions that consumers associate with different types of money. For example, money in savings was associated with peace of mind, money in the stock market created excitement, and money for everyday expenses created anxious thoughts. These three examples show just a glimpse into the complex influence that money can have on our emotional state. At 360 Credit Consulting in Austin, we want to help you learn the best ways to manage your emotions when it comes to money in order to earn the credit report you want. Continue reading to learn about the connections between your emotions and debt and call today for a free credit analysis. For many people, money is a source of stress — is there enough, how to earn more, how to manage bills. If you’re not careful, you just might find yourself sucked into a whirlwind of stressful thoughts that could lead to anxiety. Some people choose to treat themselves to something they like when they feel this way, but that only leads to spending money that they probably shouldn’t. Instead of getting stuck in this cyclical thinking, have a conversation with yourself. Think about what steps you can take to alleviate some of the stress that money causes. Create a budget, automate your bill paying, talk to an expert about the best ways to save. At 360 Credit Consulting in Austin, we are here to help you through this process. We want to provide the expert financial counsel you need to manage your money well and create a good credit report for yourself. Anger is a very complex emotion that leads one to a number of minefields. If you get in a fight with your spouse, then you might decide to go out and spend a lot of money to show them who’s really in charge. Unfortunately, this decision hurts both of you in the short- and long-term. Anger over money can also come from a poor money decisions you made, which now makes you angry for being so irresponsible. Don’t give in to regret and anger because these emotions will get you nowhere. Instead, forgive yourself and resolve to make better choices moving forward. If you choose to feel anger, then channel it into a mindset where you refuse to make those same bad decisions again. Contact 360 Credit Consulting and let us help you keep moving forward. Shopping can be a handy alternative to being bored if you work from home and are looking for a distraction. There are countless books you could buy to read on your handheld device. You could shop online at any nearby specialty grocery store and have it delivered to your door. Some online warehouses also offer seemingly unlimited items to purchase in order to make your life more convenient, happier, or more complete. Before you realize it, you may have spent the money you had budgeted for rent or other bills. Stop yourself from shopping online when you’re bored and go for a walk, take a quick nap, or even check out a book from your local library. Don’t let boredom be the reason that you find yourself with a bad credit report. 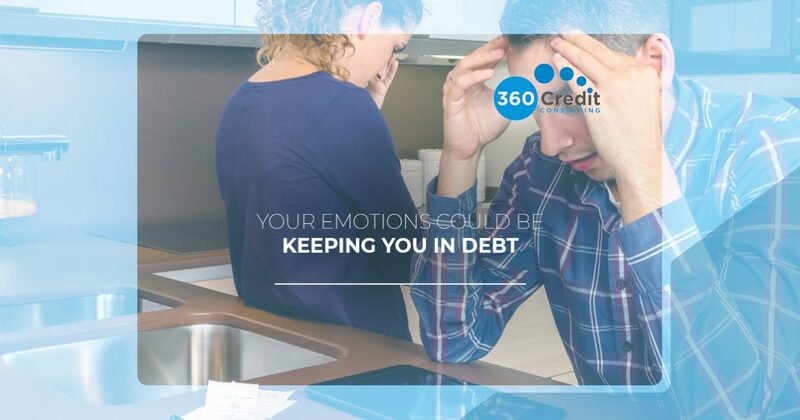 360 Credit Consulting in Austin wants to help you get to the root cause of your debt by helping you learn to manage your emotions when it comes to your finances. Please call our office today for your free credit analysis and learn how to turn things around and get the credit report you deserve.